Love Banarasi? Me too. Don’t know where you can find the best Banarasi Lehengas in Delhi? Well luckily for you, I am going to answer just that in this post. Depending on where you Shop Banarasi Lehengas, the banarasi lehenga prices can range anywhere from INR 25,000 to INR 2.5 Lakhs. It all depends on the designer tag, the work on the lehenga, and also the fabric. Banarasi Sarees, on the other hand, typically cost anywhere between INR 15,000 to INR 1.5 Lakhs depending on where you’re shopping from. At any retail store, you can easily pick a nice traditional banarasi saree for INR 10,000 to INR 40,000. But the minute you step into a designer store, get ready to shell out moolah for unique designs. 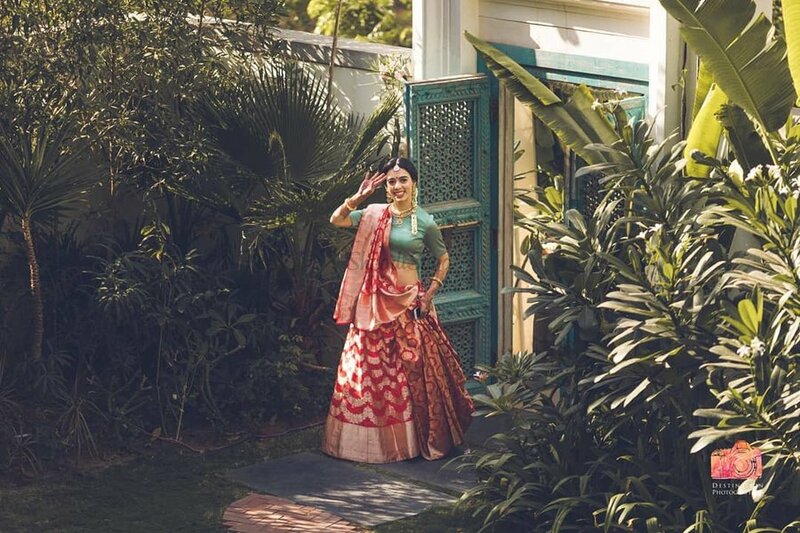 Off late, Instagram has been flooding with brides wearing banarasi lehengas. Whether it is for their wedding, or for smaller pre-wedding functions, banarasi always looks good. Plus the good part is, you don’t need to be a bride to wear a banarasi lehenga or saree or kurti for that matter. Anybody can own a banarasi outfit, and it’s the best thing you can have in your collection. Ok, coming to Delhi Banarasi lehenga shopping, there are a few good and known labels that I’m sure some of you might know of. I obviously will be listing them and giving you Banarasi Lehenga prices wherever possible. There are also some retail brands for banarasi sarees. I am only including those here in this lehenga post coz you know you can always DIY and wear the saree as a lehenga. Can I just tell you something? This is by far the best collection of Banarasi Sarees I have seen online, anywhere! They have such a good range of Banarasi Sarees on their website. If you’re free to do some casual browsing, I’d highly recommend checking their website. They have everything you’re looking for. Even if you’re not sure about investing in a Banarasi Saree, they have other forms of pure silk sarees that you can choose from. Banarasi comes in a host of different fabrics. You have Katan silk which I understand is one of the most premium kind of banarasi. Most of the pictures I’ve shared here are katan silk banarasi sarees. They are at the top end of the price point. Patola, Tusser, Kora Silk banarasi are slightly priced more affordable. The good part about this brand is it not only keeps sarees but also banarasi dupattas and lehengas. I bet at the store you’ll get to see an amazing collection. But their website also has a bunch of designs to give you an idea of what you can get for what price. This is the only fully stitched lehenga I found in their online collection. However, the real good ones are the not stitched banarasi lehengas. Some of them are actually quite affordable. Sharing my favourites here. If you have to buy the more well-known designer banarasi lehengas, you’ll know that nothing comes under INR 1 Lakh. So finding something at maybe half that price is well worth to check out at least. I bet most of you’ll know about this brand. This Defence Colony lehenga and saree store is famous for all things banarasi. They keep everything from saris, lehengas, dupattas and also fabrics that you can purchase directly. If you are seeking quality with a designer tag on it, then Ekaya Banaras is the store for you. Their outfit price range anywhere between INR 10,000 to INR 1.8 Lakhs depending on what you’re investing in. All of these silk banarasi lehengas can be purchased online as well as at their Delhi store. Ok, let me just tell you this upfront. I don’t have the prices for this brand. but safe to assume, they are in the same Ekaya Banaras price range. Maybe a tad bit higher. If you’re looking for the ultimate modern meets traditional style silk banarasi outfits, then Raw Mango’s collection will make you smile. They do the most usual colour and print combinations I have seen any brand doing. They are very very good. I browsed through their social media to bring you some of my favourite looks from their collection. Unfortunately, if you look at their Instagram now, it doesn’t show too many outfit options. But scroll down, and there are some real gems there. Recently blogger sisters Trishala and Shereen LoveBug were seen wearing gorgeous Raw Mango outfits for their pre-wedding festivities. I have written about Bageecha Banaras in most of my Banarasi lehenga posts. If you are interested in knowing their lehenga prices, check the link below. Fashion Blogger Karishma Yadav from Pink Trunkk recently wore a beautiful Bageecha Banaras Anarkali for her mehendi function. Her outfit was simple, traditional, yet it looked stunning with the decor. I don’t know much about this brand other than the fact that they deal in banarasi fabrics and sarees. Since it is based out of Delhi, you may take a look at their collection as well. Online, I couldn’t find much. But I’m sure at the store, they might have much more. These three are famous for both lehengas and bridal sarees. They have amazing designs, unique colours and the price is well below the designer label tags. If your budget for banarasi saree is anywhere between INR 20k to INR 55k you should be able to get a ton of designs to choose from. The good thing about this brand is they are all over Delhi NCR. They have an outlet in New Delhi, Noida and Gurgaon. So depending on where you’re staying visit the nearest store outlet. I haven’t fully understood what this brand offers. But here’s what I know. It’s started by designer Satya Paul and the brand is all about Indian textiles and heritage wear. This is not primarily a banarasi saree store. You will find all kinds of traditional Indian wear fabrics from Kanjeevaram to other forms of silk. Premium designers like Manish Malhotra, Sabyasachi, Ritu Kumar etc have stores pretty much in every major city. Their collections have heavy bridal banarasi lehengas which a lot of brides do opt for. You need to have a healthy budget to own one of these designer banarasi lehengas and sarees. Somone recently told me that a good hack is to visit Banaras directly and locally source the fabrics from the city. It comes at almost 1/5th the price, almost making it a budget buy. You even get readymade banarasi lehengas in Varanasi. So if you are interested, and have the time and luxury to travel, it might be a good idea to check that out.